Notice: The images - photographs, drawings, maps and track diagrams - presented in this web site are the property of the respective contributors and may not be used for any purpose without permission. For more information see Photo Credits and Restrictions. The city of Corona was founded in 1886 and known as South Riverside in its early days. The Santa Fe RR built a southern main line between Los Angeles and San Bernardino through Corona in 1887. This line was to replace the Temecula Canyon line that had been the main line from San Diego to San Bernardino but had washed out after heavy rains in the canyon several years earlier. The ex-Santa Fe tracks through Corona are now used by BNSF and Metrolink. Corona was laid out inside a wide circular boulevard (Grand Blvd.) three miles in circumference. 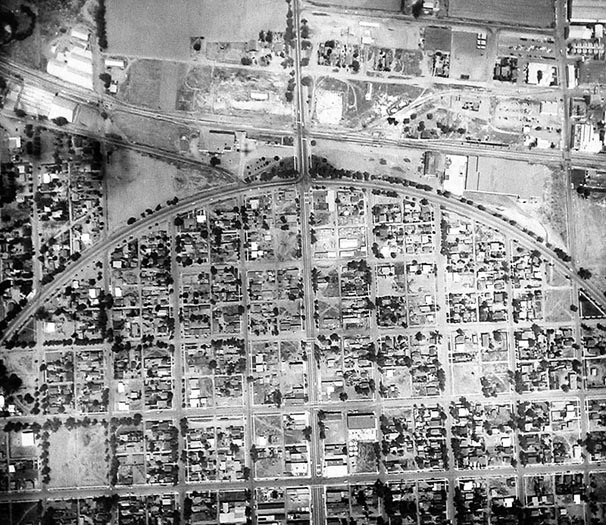 An aerial photo taken in May 1955 shows this layout as well as many packing houses located along the Santa Fe right-of-way at the north end of the city (Figure 1). The southern side of Corona was left to citrus groves although several packing houses were built close to these groves in the 1930s. Figure 1. Aerial view of the north half of Corona in 1955. From the collection of the Corona Public Library - used by permission. The Santa Fe built a large frame depot in Corona in 1906 to serve the growing town and industries. 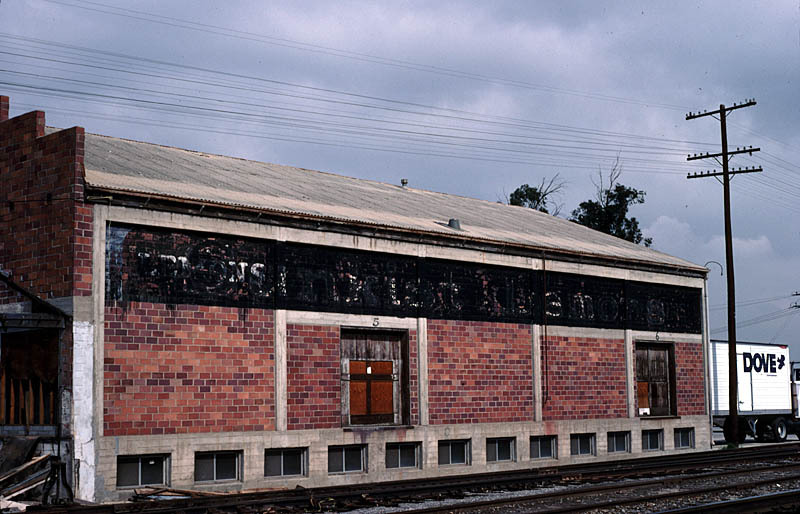 This depot was replaced by a modern stucco depot in 1937. It remained in service for 50 years until it was closed in the late 1980s. The Pacific Electric Railway operated a line from Riverside through Arlington to Corona, where it ran west on 3rd St. to Merrill. The section from Arlington to Corona was placed in service in February 1915. 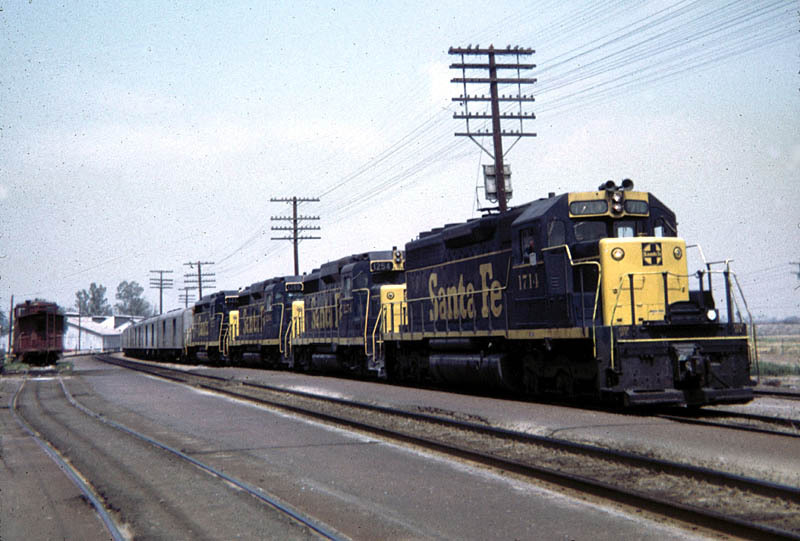 PE maps show three spurs for freight service that terminated next to the Santa Fe tracks in the packing house area. 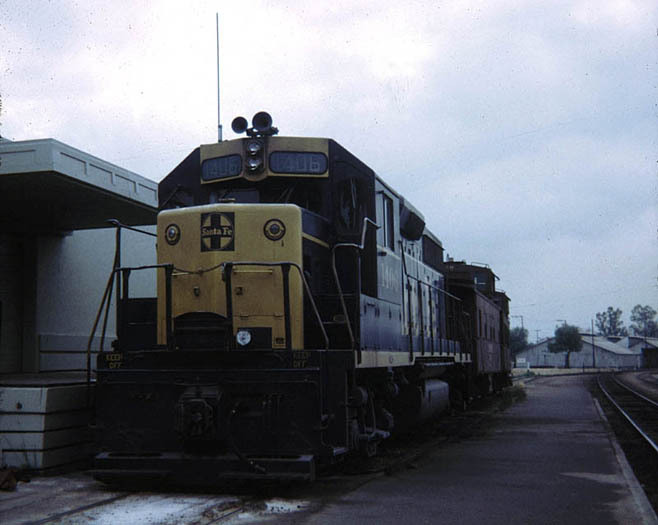 The PE was eventually merged into parent Southern Pacific and the line into Corona was abandoned by the SP in June of 1973. 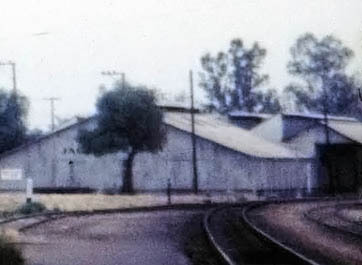 The PE Corona depot was on Third Street. Corona packing house and industry locations along the Santa Fe west of Pearl Street are identified by numbers in Figure 2. Some of these locations are also indicated in Figure 3 and additional packing house locations east of Pearl Street are identified in Figure 4. The Santa Fe station is at location A in Figures 2 and 3. Figure 2. Packing house and depot locations in Corona. From the collection of the Corona Public Library - used by permission. Figure 3. PE map showing ATSF and PE tracks and packing house locations on the west side of Corona. Figure 4. PE map showing ATSF and PE tracks and packing house locations on East Side of Corona. The packing house locations are also identified on two official Santa Fe track diagrams from the John Signor collection. These diagrams can be viewed in a separate browser window by clicking on the diagram name. Diagram JS-1 is undated but is probably from the 1915-1930 time frame. Diagram JS-2 is dated 1949 but has been revised at a later date, probably sometime between 1955 and the early 1960s. Note: These track diagrams may be wider than your display and, depending on your browser, you might have to click on the diagram to view it at its maximum size. The following table lists the names of the citrus packing houses or related industries at each of the locations identified in Figures 2-4 and in Diagrams JS-1 and JS-2. Multiple names indicate changes that occured over the period from about 1900 through the 1960s. Names in italics are those of non-citrus businesses occupying the location after closure of a citrus-related business. The packing houses are described in more detail following the table. The descriptions are based primarily on information contained on Sanborn Fire Insurance maps and Santa Fe track diagrams. The available Sanborn maps for Corona are dated 1900, 1907, 1911, 1928 and 1942. The packing house descriptions that follow are based primarily on information contained on Sanborn Fire Insurance maps and Santa Fe track diagrams. The available Sanborn maps for Corona are dated 1900, 1907, 1911, 1928 and 1942. Packing Houses Up To 1900 By 1900, four packing houses had been built along the ATSF mainline on the north side of town. The first of these was the Sunset Fruit Co. (Location 1) located on the west side of Sheridan north of the ATSF tracks. 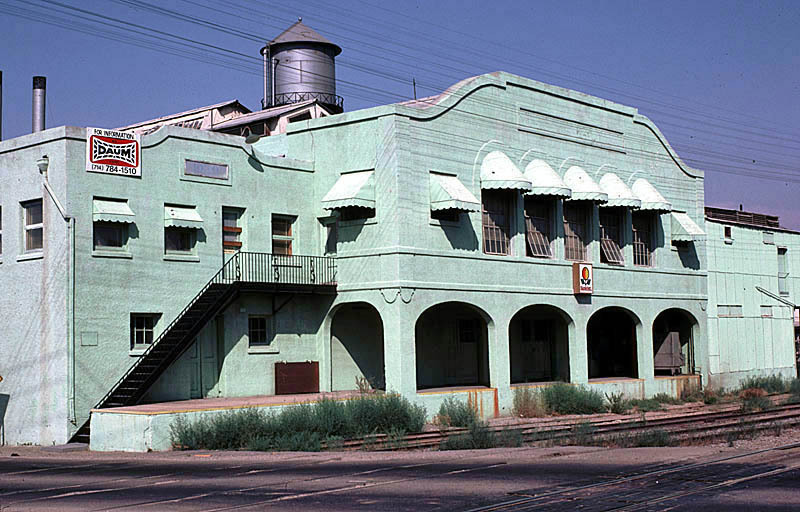 It was renamed the Corona Citrus Association (CCA) around 1910 and underwent several expansions during the next 35 years before burning down in 1945 (Figure 5). Figure 5. Corona Citrus Association Packing House in 1930. From the collection of the Corona Public Library - used by permission. 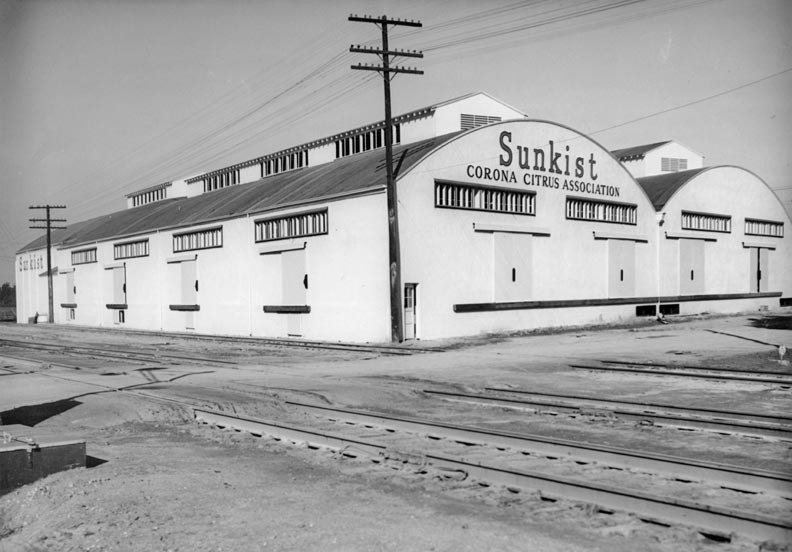 The CCA packing house was rebuilt in 1947 and a photo taken in 1956 shows it in operation under the Sunkist label (Figure 6). The CCA packing house had a capacity for 120 cars of fruit in two pre-cooler rooms and three lemon storage rooms. It was no longer in use as a packing house in 1990 (Figure 7). Figure 6. Corona Citrus Association Packing House in 1956. From the collection of the Corona Public Library - used by permission. Figure 7. 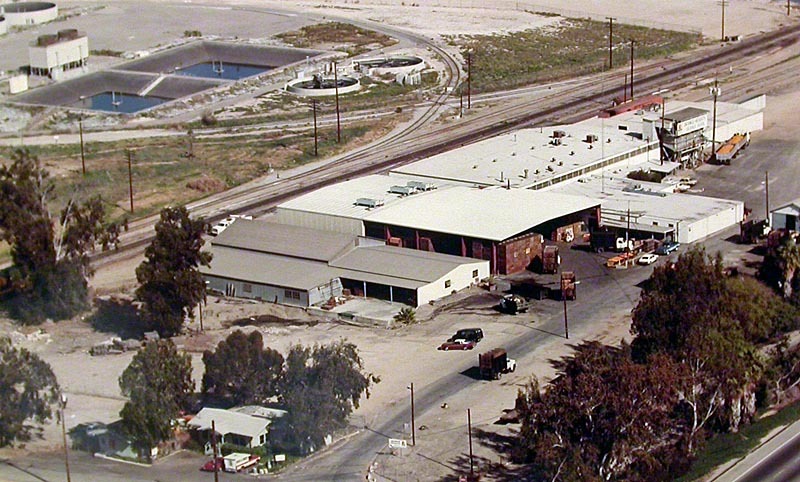 Corona Citrus Association Packing House in October 1990. Bob Chaparro photo. The W. H. Jameson packing house (Location 2) was the only packing house to operate in Corona under the same name over its entire history. 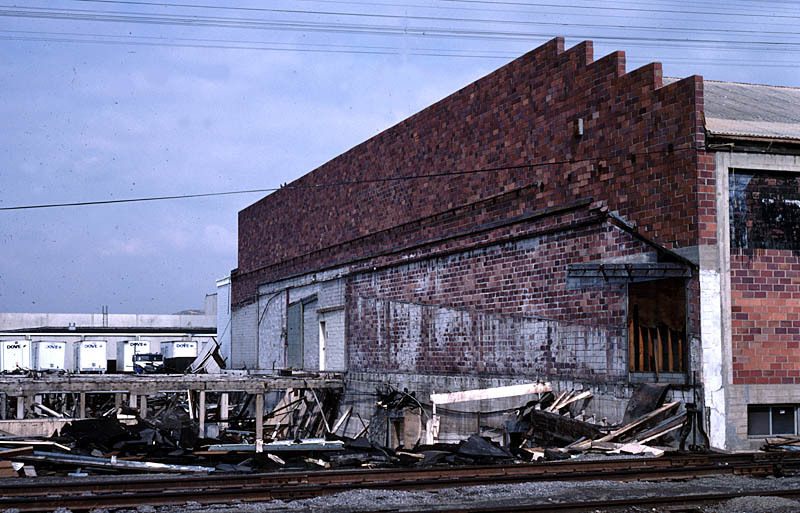 This packing house was located west of Sheridan and south of the ATSF tracks across from CCA. 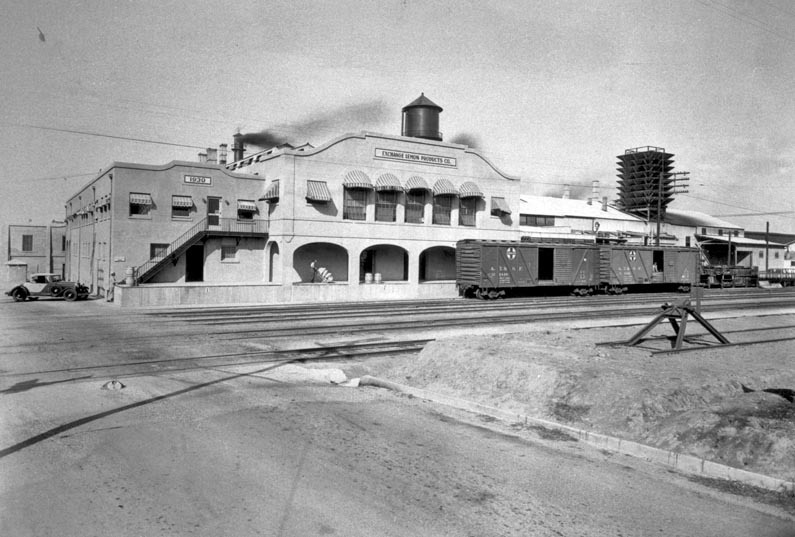 The packing house was also served by the Pacific Electric Railway and was at the very end of the PE line from Riverside to Corona. The PE track came north from Third and Merrill Streets on a right-of-way west of Merrill. The route is shown in Figure 3 where the Jameson packing house location is indicated by 2. Bob Gaddie has provided a photo of the Jameson packing house from 1964. W. H. Jameson Packing House. January 11, 1964. Robert Gaddie photo. The following is Bob's descriiption of the photo: "I am standing on the Pacific Electric Corona line. The branch ends about 100 yards behind me. The track curving to the right is the PE "main line" and it will cross Railroad Avenue. Beyond Railroad Avenue is a passing track (see Figure 3). Then the line continues on private right of way to Third Street. It operates down the middle of Third Street to east Grand Boulevard where it regains private right of way and continues to Riverside. The track going straight in the photo serves theJameson Company packing house. The packing house can be seen at the end of the track. To the left of the PE track is the Santa Fe spur serving the packing house. To the left of the spur is the Santa Fe main line. 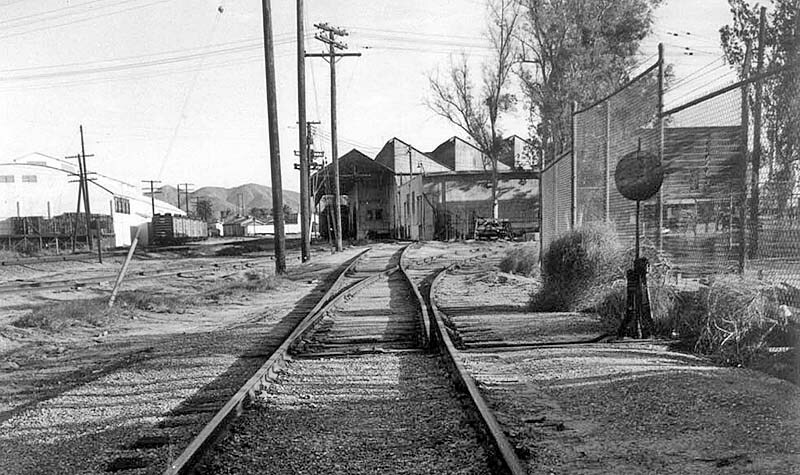 To the left of the main line is the Corona Citrus Association packing house. Since it was January the refrigerator cars are for Navel oranges that were being harvested." A 1960s-era Sunkist map indicates that the Jameson packing house was by then part of the Corona Citrus Association. The packing house closed in 1963 and, after a fire in 1974, was torn down in 1975. The packing house shows in the background of Figures 8 and 9 - photos taken by Cliff Prather in 1968. Figure 8. 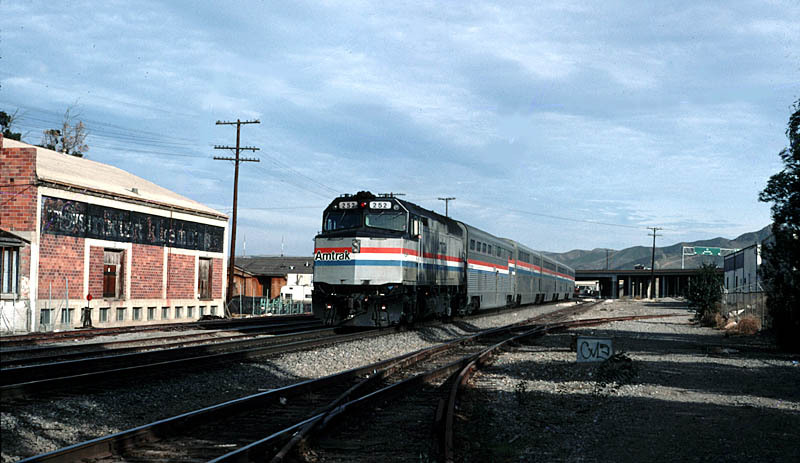 An eastbound freight passes the corona depot in April 1968. The baggage cars had come west on Train 55, a short-lived successor to the Fast Mail, and were returning to the east. The Jameson packing house is visible in the background. Cliff Prather photo. in the background. Cliff Prather photo. The following pair of somewhat fuzzy images are close-ups of the Jameson packing house cropped from Figures 8 and 9. 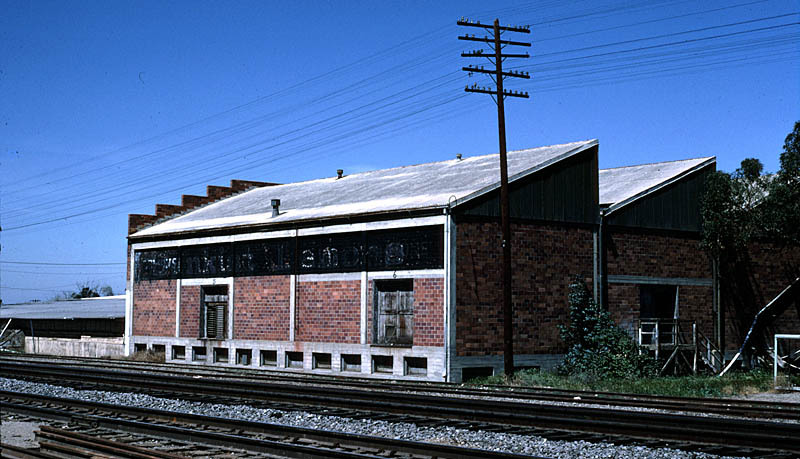 The Flagner packing house (Location 9) was located east of Joy and north of the ATSF tracks. Later Sanborn maps change the name to Flagler. This packing house disappeared when the Exchange Lemon Products plant was built in 1915 at the same location. The Thieme Lemon Products plant (Location 5) was built in 1905 and was located on a spur east of Main St. on the north side of the tracks. By 1907 the packing house had changed its name to Orange Heights Fruit Association. 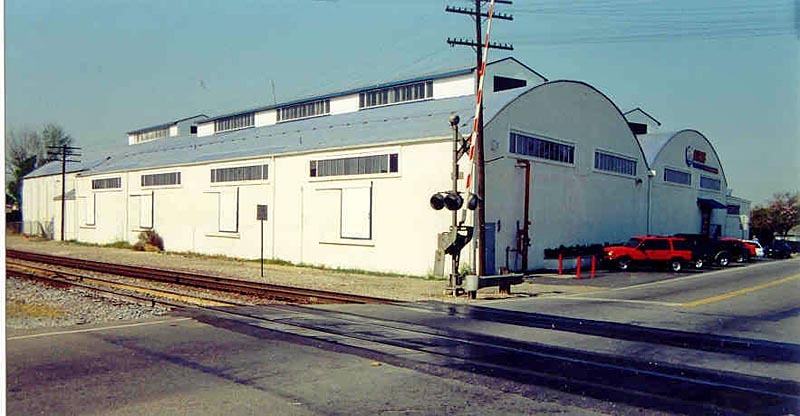 The packing house was greatly expanded in the early 1920s and by the 1940s was renamed the Corona Foothill Lemon Co. - not to be confused with the Corona Foothill Lemon packing house located east of Pearl and north of the ATSF tracks (Location 10). In fact, several companies owned two packing houses and used one to pack oranges and the other lemons and then bought other properties and moved their operations to larger or better facilities when the opportunity arose. 1900 to 1910 By 1910 five additional packing houses had been built along the ATSF tracks. 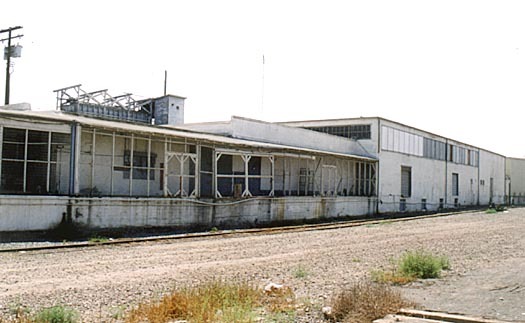 The Corona Packing Co. (Location 3) was located just west of the ATSF Corona Depot but only operated a few years before changing names to Randolph Fruit Co. By 1928 this packing house was named the Riverside County Select Groves after some expansion in size. By the 1940s it was further expanded and given a new name, the Corona Mutual Groves Inc. The California Citrus Union packing house No. 39 (Location 4) was built directly across the tracks from the ATSF depot just west of Main St. By the 1920s this packing house had been converted to a box factory known as the Corona Box Company. It burned down during WW2. The Boston and South Riverside Fruit Co. packing house (Location 7) was built west of Joy, south of the ATSF mainline and north of the end of Howard St. In 1911 it was the Orange Heights Fruit Association Orange packing house which expanded in the 1920s. It was destroyed by fire on September 21, 1941. The Corona Lemon Co. packing house (Location 10) east of Pearl and north of the ATSF was also built during this time. Corona Lemon expanded in the 1920s and continued operations through the 1940s packing for Sunkist. 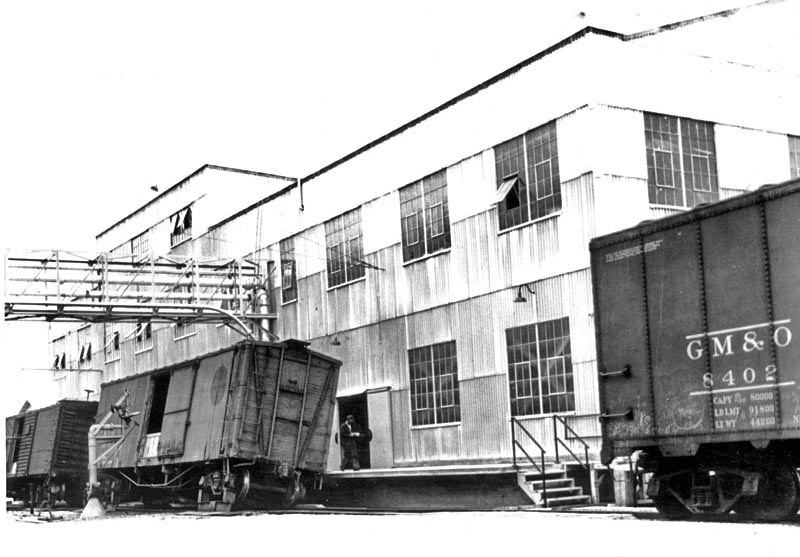 A good view of the north side of Corona Foothill Lemon packing house is shown in Figure 10. The older wood part is at the right and the newer brick part with the sawtooth factory roof is at the left (Locations 10 and 11). Note the chute that goes across the roof leading to the cull bin. The packing house was sold to Sunkist in 1956. Figure 10. Corona Foothill Lemon Packing House (near side of tracks), A.F. 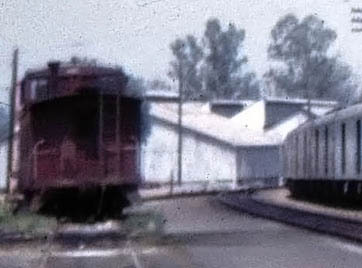 Call Packing House (far side of tracks at right) and (third) Orange Heights Packing House (far side of tracks at left). From the collection of the Corona Public Library - used by permission. 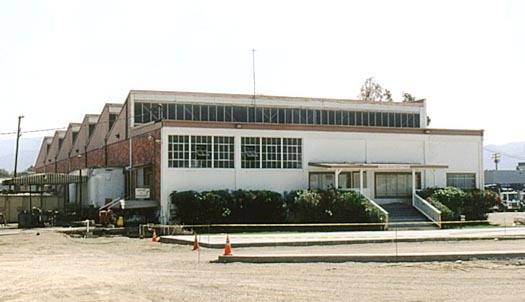 The Corona Foothill Lemon packing house closed in 1966 and a part of the original wooden structure was demolished in 1972. Figures 11-15 show the remaining parts of the packing house up to 1990. 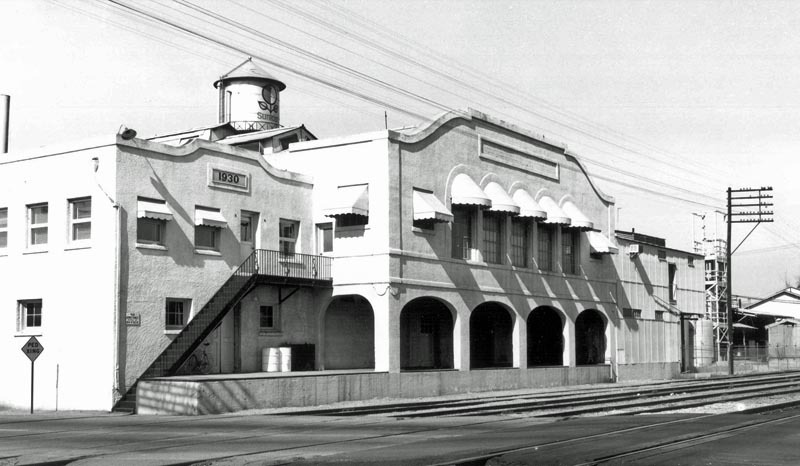 A new Corona Foothill Lemon packing house was built in the post-WW2 period south of the Santa Fe tracks at Howard St. (Location 7). The roof of the packing house can be seen in Figure 2 and at the very bottom of Figure 16. Figure 15. Trackside view of the formerCorona Foothill Lemon from the southwest in October 1990. Bob Chaparro photo. The Call Fruit Co. packing house (Location 12) was also built prior to 1907 east of Pearl St. and south of the ATSF tracks across from the Corona Lemon packing house. It is shown across from Corona Foothill Lemon in Figure 10. The location appears as a vacant lot in Figure 16. Figure 16. In this aerial view looking east, the Borden Company Manufactured Products Division is at the center of the photo. Directly across the ATSF tracks to the left and barely visible is Exchange Lemon Products. The A.F. Call packing house was located where the vacant lot is above Borden’s. The Corona Foothill Lemon packing house is in the upper left. The (third) Orange Heights packing house is at the very top of the photo. The roof at the very bottom of the photo is believed to be the final location of Corona Foothill Lemon Company. From the collection of the Corona Public Library - used by permission. The Call Fruit Co. packing house was expanded within a few years with additions of lemon curing and packing space. By 1928 it had been renamed the A. F. Call Estates Orange & Lemon packing house and continued in operation through the 1940s. Both the Santa Fe and the PE served this location. 1911 By 1911 one additional packing house shows up east of Main St. and south of the ATSF main line but without a name or railroad spur so it may have been under construction (Location 6). By 1928 it was identified as the Sparr Fruit Co. The 1942 Sanborn map shows a fertilizer storage building at the same location. 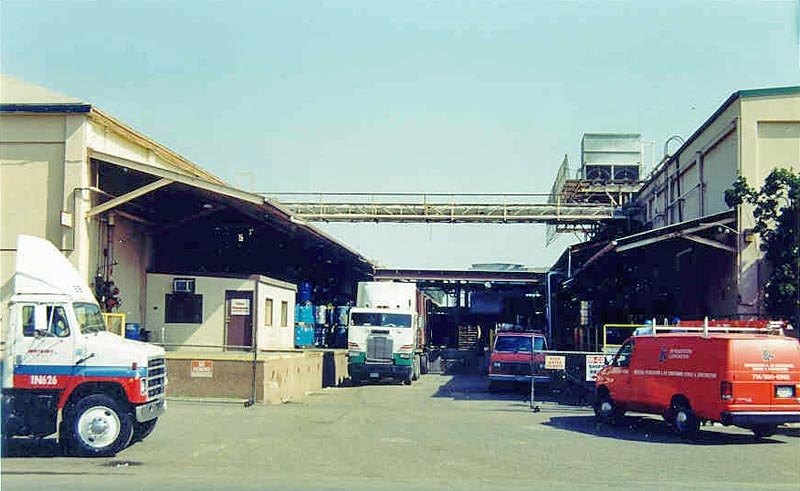 A building on the same site is shown in Figure 7 at the right behind the Santa Fe reefer. 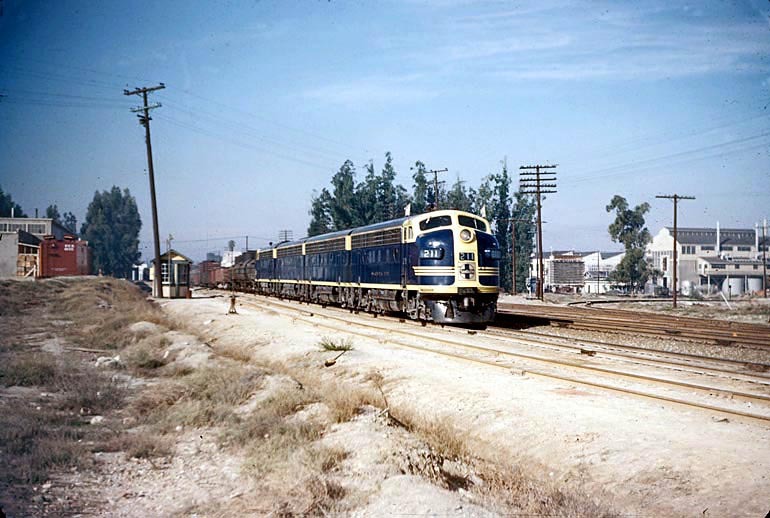 The photo also shows the eastbound Grand Canyon leaving Corona in April 1968, shortly before the train lost its name and was switched to the Santa Fe’s second district line via Pasadena. Figure 17. The eastbound remnant of the Grand Canyon leaves Corona in a photo looking east from Main Street in April 1968. The building on the right is at the location of the former Sparr packing house. The Santa Fe reefer at the right is sitting on the Corona team track. Cliff Prather photo. 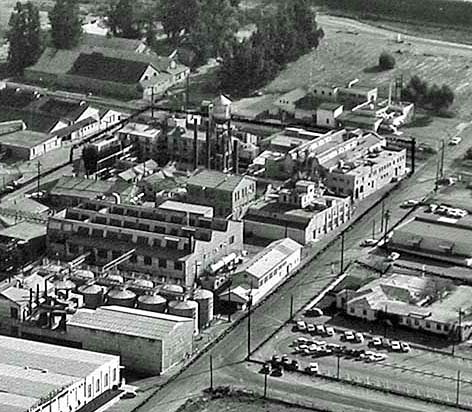 1915 The largest citrus facility in Corona was the Exchange Lemon Products Co. (Figure 18). It was created in 1915 as an outlet for cull lemons. Products included citric acid, oil, pectin and lemon juices. 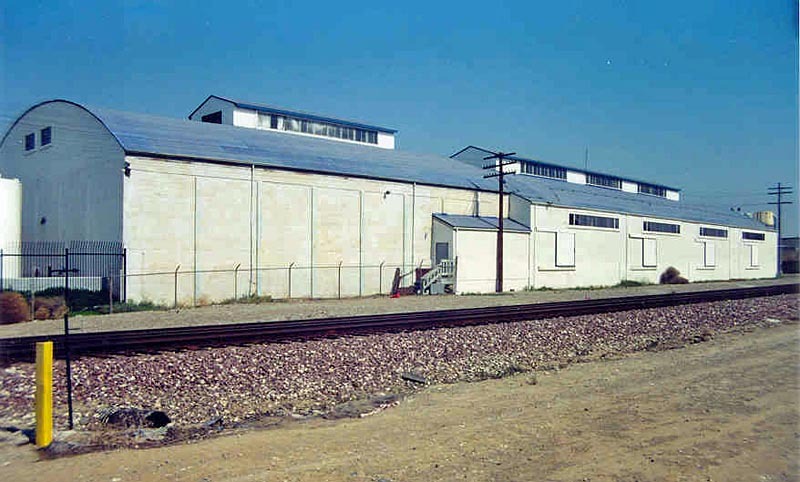 The first Exchange Lemon Products plant (Location 9) was located east of Joy on the north side of the ATSF main line. Figure 18. The complex at the center of the photo surrounding the tall water tank is the Exchange Lemon Products. At the upper right is the Borden Company Manufactured Products Division. 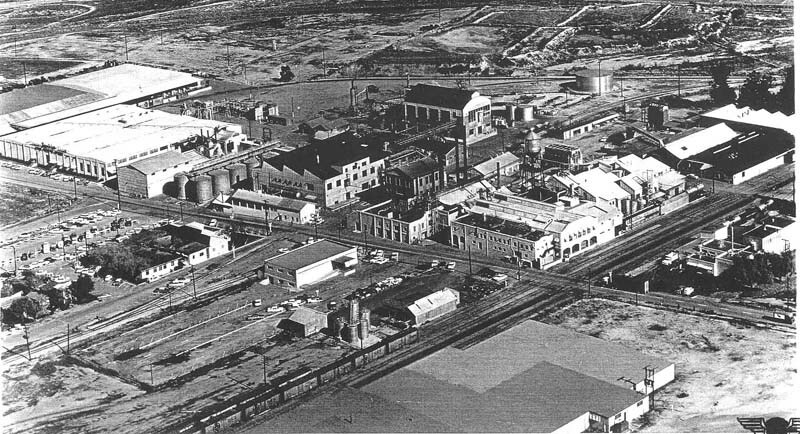 At the upper left are the Corona Lemon packing house (near side of tracks) and the A. F. Call packing house (far side of tracks). From the collection of the Corona Public Library - used by permission. That structure was replaced by a much larger structure built in 1930 that extended across Blaine St. on the east side of Joy (Figure 19). Figure 19 Exchange Lemon Products from the south in 1938. From the collection of the Corona Public Library - used by permission. This aerial shot taken several years later shows the extent of the facility in full operation at its peak (Figure 20). Figure 20. Aerial view of Exchange Lemon Products from the southwest in 1964. Figure 21 shows Exchange Lemon Products in 1983. Note the date 1930 on the wall below the water tank. Figure 21. Exchange Lemon Products from the southwest in 1983. Ed Workman photo. 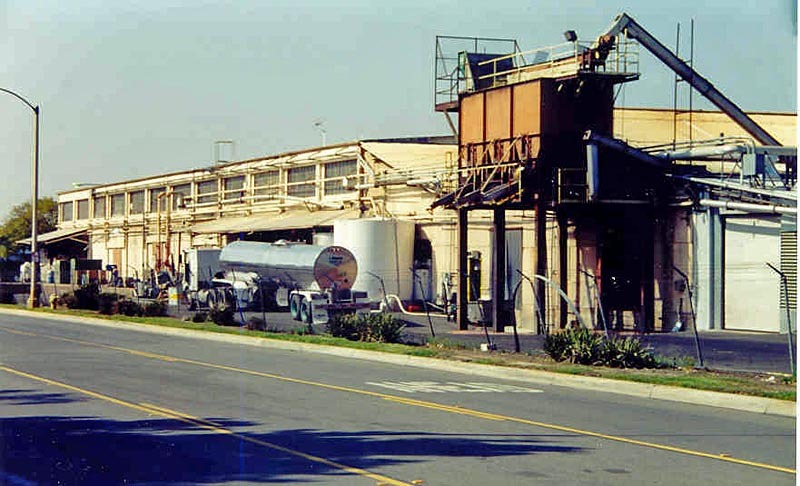 Exchange Lemon closed in 1984 when Sunkist consolidated its juice operation at its other plant in Ontario, California (Figure 22). Figure 22. Exchange Lemon Products from the southwest in September 1984. Bob Chaparro photo. Another photo from the Corona Library collection shows how cull lemons were transported to Exchange Lemon in box cars and unloaded from each car similar to unloading grain from box cars at the time (photo 23). Figure 23 Boxcars of cull lemons are unloaded at Exchange lemon Products by tilting the cars. From the collection of the Corona Public Library - used by permission. 1920s Two new packing houses were built in the 1920s. The Charters-Davis Co. 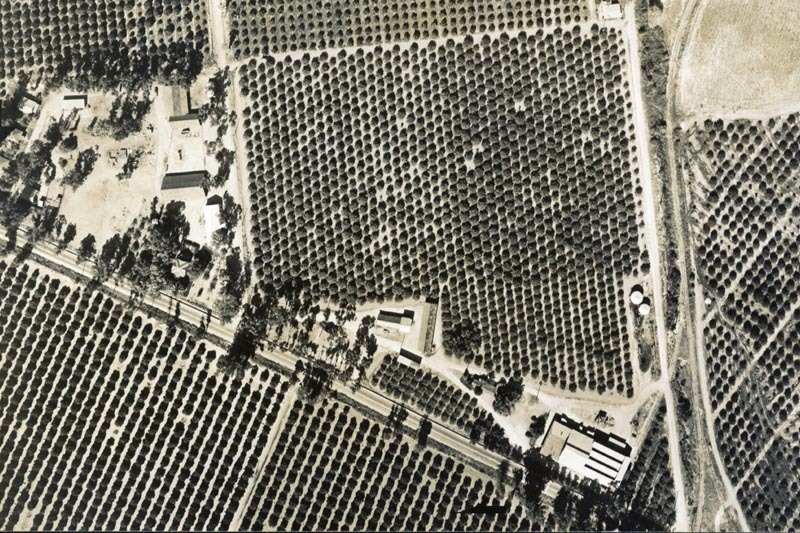 Lemon packing house was located 3 miles SE of downtown Corona on Ontario Ave. An aerial shows this packing house, the Santa Fe spur track, and the surrounding citrus groves (Figure 24). This packing house was expanded and renamed R. H. Verity Sons and Co. by the 1940s. This packing house was closed in 1948 and burned to the ground in 1989. Development has removed most trances of the packing house, Orange Groves and the Santa Fe spur tracks. Figure 24. Aerial view of the Charters-Davis Co. Lemon packing house. A large packing house was built on a spur next to Chase Dr. (formerly Lemon) 4 miles SE of Corona and was known as the American Fruit Growers packing house. Bob Gaddie has provided a photo of the packing house from 1937. American Fruit Growers packing house. June 29, 1937. Photographer unknown, Robert Gaddie collection. 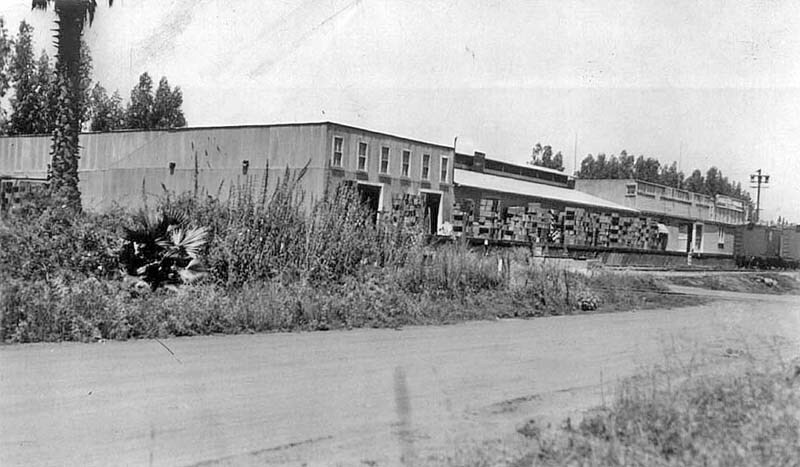 Bob Gaddie provided this description for the photo: "This is the American Fruit Growers packing house located at the end of Santa Fe's 'mining spur.' The mining spur left the Elsinore district about a mile south of Pophyry. It served two quarries and three packing houses. This packing house was located on Chase Drive and Compton Avenue. The spur paralleled Compton Avenue.You can [just] see the tracks of the spur crossing Chase Drive. The photographer is standing along Chase Drive looking west. The spur went about 1/4 mile to the left of the photographer. At this location were smudge oil tanks. Tank cars of oil would be delivered during the winter. Sometime after this photograph was taken the open dock of the packing house was enclosed. During the late 1940s or early 1950s American Fruit Growers became American National Foods. The packing house closed in the late 1950s or early 60s. In the late 1960s the building became the headquarters of the Jameson Ranch." Bob Gaddie's family was closely associated with the American Fruit Growers packing house. His family moved to Corona in 1915 and both of his grandfathers were involved in the citrus industry. His dad was a ranch foreman. His uncle was the packing foreman at American Fruit Growers until just before it closed and his mother worked in the office in the 1930s and 40s. When Bob was born his father worked for American Fruit Growers but when Bob was about four years old his dad took a job with the A. F. Call Estate. Bob wrote "We moved down to the old A. F. Call house on Ontario Avenue. The Call ranch was immediately west of the Verity Ranch. 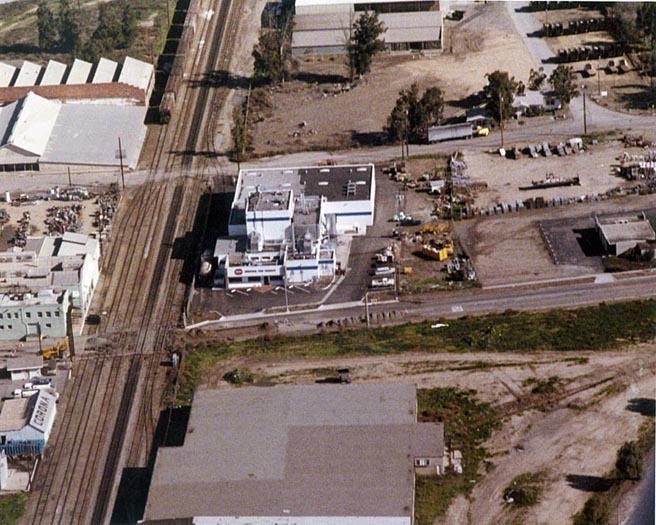 In the aerial photo of the Verity packinghouse I can see the roof of our house (Figure 24). We lived in that house until 1966." Figure 25. Borden Milk Company in December 1991. Bob Chaparro photo. 1940s A new Orange Heights Orange Association packing house was built east of the former A. F. Call packing house in 1942 (Location 13) after their packing house at Howard St (Location 7) burned down in September 1941. The packing house is shown in Figure 26. A Sunkist map from the early 1960s indicates that at that time Orange Heights Orange Association also operated a packing house at the site of the former A.F. Call Estates (Location12). Figure 26. Orange Heights Orange Association packing house from the southwest. Note the cull bin and the trailer loads of cull oranges. A reefer is at the loading dock on the track side of the building. From the collection of the Corona Public Library - used by permission. 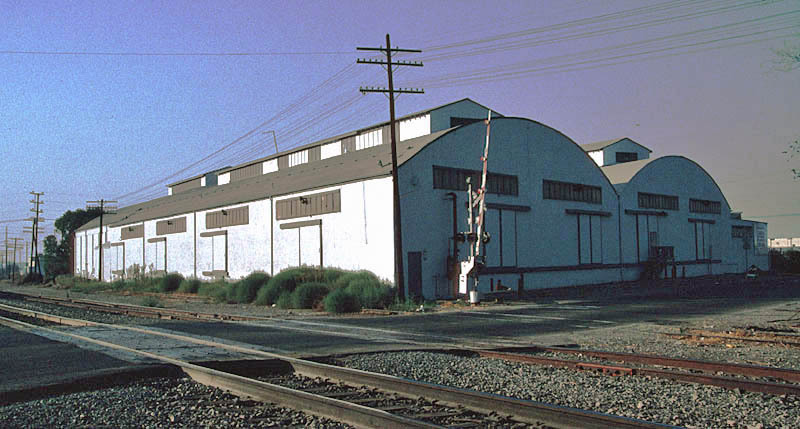 A Pacific Electric spur off their main line between Riverside and Corona originally served this packing house, the third for Orange Heights in Corona (Figure 27). 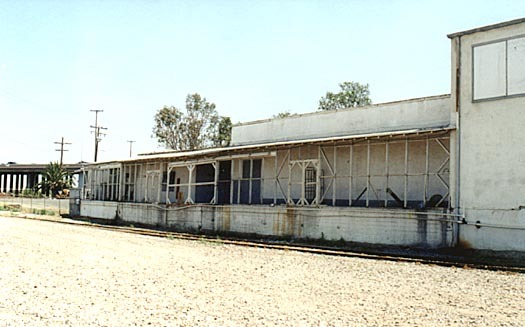 After the PE discontinued freight service to Corona a new spur came off the Santa Fe main line to serve this packing house. The packing house continued in operation until 1998 and was still standing in 2006. Figure 27. An eastbound Santa Fe freight passes the scale house in Corona in 1949. The Orange Heights Orange Association packing house is at the far left with a wood PFE reefer on the PE spur. Jack Whitmeyer photo, SFRH&MS collection. "In the late 1940's my dad took a job with the Call Estate as a foreman. In the early 1950s the Corona Foothill Lemon Company took over the Call Estate. I recall my dad saying that they leased the ranch. They may have bought it at some point. My dad went to work for Foothill as foreman over the former Call orchards. "Foothill packed their oranges and grapefruit through Orange Heights. After my Dad went to work for Foothill he was put in charge of coordinating and supervising [the] harvest for Orange Heights. In the 1950s Orange Heights began packing some fruit from Orange County. The fruit could not be packed in the Orange Heights packing house. I believe this was due to some disease or insect problem in Orange County. It may have been due to the Tristeza (Quick Decline) outbreak at that time. Each summer the Call house would be opened for a few weeks to pack the fruit from Orange County. I rode with my dad frequently in the summer. I can recall going to the Call house when it was operating. Unlike the Orange Heights house the Call house was an antique. The field boxes were dumped one at a time (the Orange Heights house had a continuous dump line). The Call house was very dark. The only light I can recall was over the grading table. The fruit was moved around the house on hand trucks. The Orange Heights house used conveyer belts to take the packed fruit into the cold room and move it out of the cold room into the refrigerator cars. 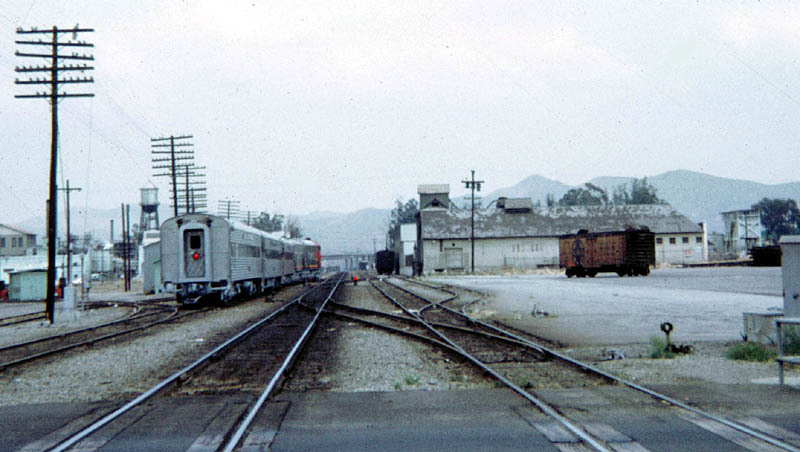 During the time the Call house was operating the PE would spot a couple of refrigerator cars on the spur that ran along Pearl Street next to the Call house (see Figure 4). The Call house also had a Santa Fe spur. I have no idea what was the last year the Call house operated." Corona Citrus Association, Jamison packing house, Corona Foothill Lemon on Joy and Pearl and both Orange Heights packing houses were packing under the Sunkist brand in the 50s and early 60s. Postscript As of 2006, only three of the former Corona packing houses are still standing. The Corona Citrus Association building is now the headquarters for Lucas Oil Products (Location 1), which started operation in Corona in the 1990s. Figures 28 and 29 provide a track side view where former loading doors can still be seen while Figure 30 shows the front looking SW. Figure 28. The former Corona Citrus Association from the southwest in 2002. Bill Messecar photo. Figure 29. The former Corona Citrus Association from the southeast in 2002. Bill Messecar photo. Figure 30. The former Corona Citrus Association from the northeast in 2002. Bill Messecar photo. 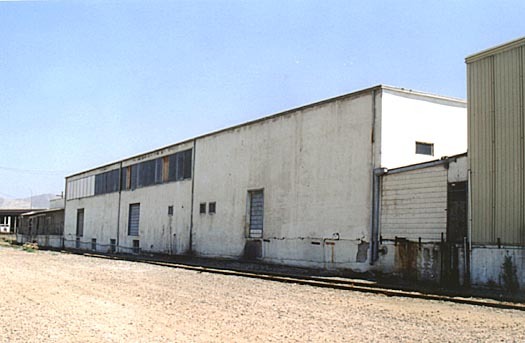 The eastern part of the Corona Foothill Lemon packing house (Location 11) is now owned by Pacific Utility Installation. Figures 31 and 32 show this remaining part of the packing house from track side while Figures 33 and 34 show the north side and northeast corner. Figure 31. 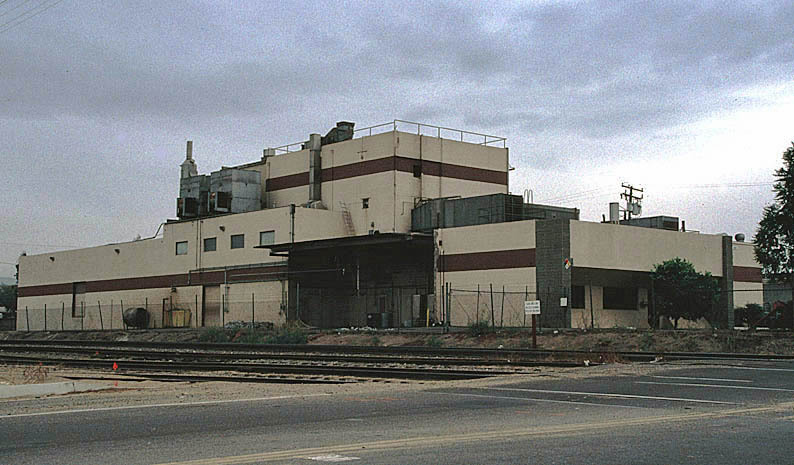 The former Corona Foothill Lemon packing house from the southwest in 2002. Bill Messecar photo. Figure 32. 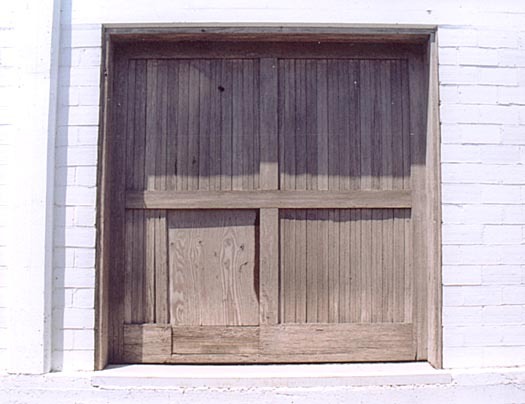 Loading door of he former Corona Foothill Lemon packing house in 2002. Jim Lancaster photo. the building was occupied by American Standard Concrete Pumping. Jim Lancaster photo. Figure 34. 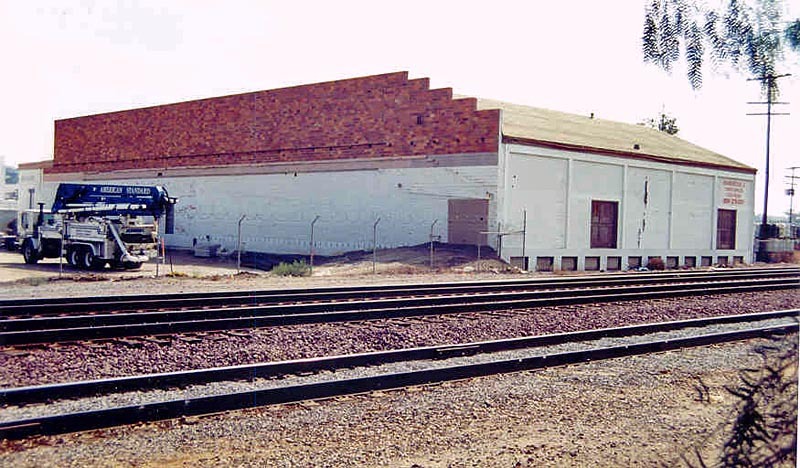 The former Corona Foothill Lemon packing house from the northeast showing the sawtooth roof in 2002. The Orange Heights packing house (Location 13) is now Newport Farms. (Figures 35-38). Figure 35. 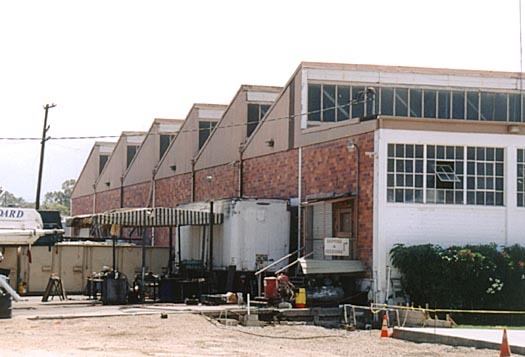 The former Orange Heights Orange Association packing house from the south in 2002. The cull bin is still standing. Jim Lancaster photo. Figure 36. 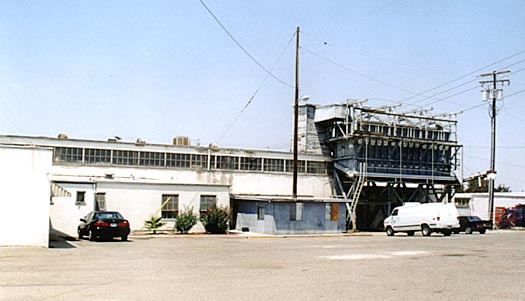 The former Orange Heights Orange Association packing house from the northwest in 2002. Rather than connecting to the PE, the siding now connects to the BNSF. Jim Lancaster photo. Figure 37.The northeast corner of the former Orange Heights Orange Association packing house in 2002. Figure 38. The northeast corner of the former Orange Heights Orange Association packing house in 2002. This is where the PFE reefer is sitting in Figure 27. Jim Lancaster photo. 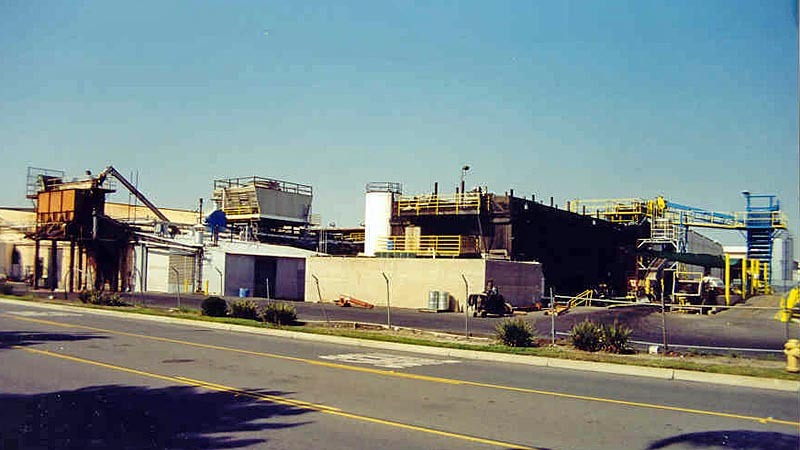 The Exchange Lemon Products facility north of Blaine was the only part remaining in 2003 (Figures 39-41) but had been renamed Hi-Country Juice. It was closed by the following year. The final remains of the Exchange Lemon plant were vacant in 2005 and bulldozed in 2006. Figure 39. Former Exchange Lemon Products in 2002. Bill Messecar photo. Figure 40. Former Exchange Lemon Products in 2002. Note the cull bin at the left. Bill Messecar photo. Figure 41. Close-up view of the cull bin at the former Exchange Lemon Products in 2002. Bill Messecar photo. To tour other Riverside County cities, or other counties, return to the Virtual Tour of Riverside County Page. This page was last updated on 9 February 2007. The latest revisions are in dark blue text.